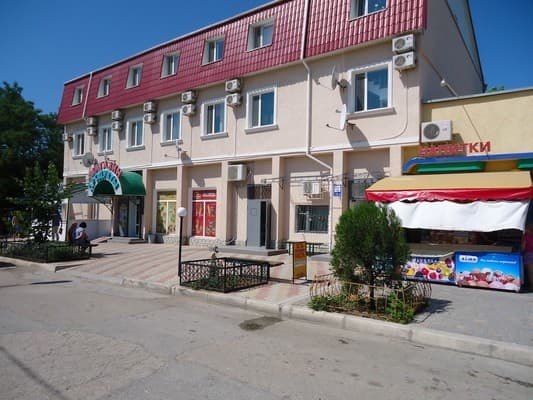 Private hotel "Real" located in a park area 250 meters from the sea. Near the hotel: cafes, shops, market; convenient transport interchange. The hotel "Real" spacious comfortable rooms, equipped with new furniture, bathroom, satellite TV, individual air conditioning and other amenities necessary for a comfortable stay. Cold and hot water is served around the clock. On site, there is a cozy sitting area, equipped for barbecue. At the request of the residents - next to the hotel in the sanatorium there is an opportunity to order meals (three times a day). Description of the room: Triple room with one double and one single bed. Room with all amenities (toilet, washbasin, shower), equipped with a refrigerator, TV, air conditioning. Cold and hot water supply is available 24 hours a day. Description of the room: In the room there are two separate single beds, a wardrobe, a table with chairs. Also the room is equipped with air conditioning and TV. Room with all amenities; Cold and hot water constantly. Description of the room: One room with one double + one single bed, wardrobe, table with chairs. Room with all conveniences, equipped with a refrigerator, air conditioning, an electric kettle and a set of dishes. Cold and hot water supply is available 24 hours a day. Рядом с морем. Чисто. Персонал вежливый,внимательный. Тесно. Окно под потолком. Воздух в номере был какой-то затхлый. негде сушить белье,на маленькой сушилке ничего не сохнет. Children under 5 without extra bed - 25 UAH. per day / person. For the main place -10%, for an additional seat (folding bed) -50%. Cozy private hotel "Real" located 250 meters from the sea in a park area. Near the hotel "Real" sanatoriums "Sunny" and "Primorye" are located, where it is possible to undergo a course of treatment. To get to the Crimea is most convenient by samllet to the international airport "Simferopol". 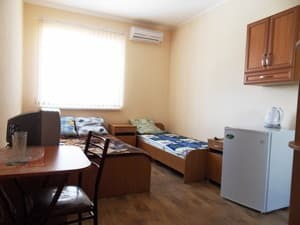 The distance from Simferopol to Evpatoria in 70 km can be overcome both by bus (1 hour and 20 minutes en route) or by ordering a pre-transfer from the airport (1 hour en route).